Apple AirPlay 2 – everything you need to know | What Hi-Fi? After a lengthy wait between announcement and availability – and a long overdue update – Apple's AirPlay 2 is finally here. First announced at Apple’s 2017 World Wide Developer Conference (WWDC), the much-needed update to Apple’s own streaming protocol finally became public in June 2018 as part of the iOS 11.4 software update. What's the big deal? First and foremost, AirPlay 2 supports multi-room streaming. With multi-room products becoming a household staple in the last ten years, Apple's move into multi-room audio could be seen as either coming in a bit too late or a welcome alternative to current methods. Whether it’s using Apple’s own HomePod speaker or other audio brands’ compatible speakers (including Sonos One), Apple is hoping to make its mark in the multi-room market. And in 2019 you'll be able to access AirPlay 2 on a number of TVs, with select models from LG, Samsung, Sony and Vizio all set to arrive with AirPlay 2 onboard. The first iteration of AirPlay was launched back in 2010 as part of iOS 4 (around the time of the iPhone 4). Originally it was a way to stream audio, video and photos wirelessly to the Apple TV, but eventually this opened up to include dedicated audio products. It was based on Apple’s ‘AirTunes’ software from 2004, which was predominantly used to stream audio from iTunes to AirPort Express, so you could wirelessly listen to music across your home network from your Apple device. Setting itself apart from Bluetooth, AirPlay uses your home’s wireless network to send content from one source (iPhone, iPod etc) to one compatible product (speaker, AV receiver, soundbar). During the early days of AirPlay, setting products up was a complicated, long-winded process that required an extra app – it was hardly seamless. Those early products also didn’t have the most stable connection, so music would often drop out. Updates to AirPlay over the years have made the setup process much simpler and quicker, and streaming is far more reliable. As long as your Apple device and the AirPlay speaker are on the same wi-fi network, music can be streamed between the two at the tap of a button. The biggest feature of AirPlay 2? Multi-room. It’s Apple’s first real move into multi-room technology, with AirPlay 2 finally bringing the ability to stream music from your iOS device to more than one product. Originally meant to launch with the Apple HomePod smart speaker, it was designed to let you set up two HomePods as a stereo pair (which we’d recommend) and pepper multiple HomePods around your home - all controlled by your iOS devices. But it’s not restricted to Apple’s own ecosystem. You can mix-and-match AirPlay-2 compatible speakers from other audio brands to create a more versatile multi-room system. As long as all the devices are on the same wi-fi network, you simply have to access the music controls on your iPhone, Apple TV or MacBook's iTunes and select a connected speaker (or more) to send the music to. Much like Sonos’s app, you can define where in your house the speaker is located, using labels such as ‘Bedroom’ or ‘Kitchen’ to identify them. This can be done in the Home app, which you’ll also need for any Apple smart home actions. After that, simply access the Control Centre at any point on your iOS device to control which speakers are playing at any time, both individually and as a group. Other benefits of AirPlay 2 include improved audio buffering, integration with Siri voice control and multiple control access across iOS devices (a useful touch for multi-room streaming). 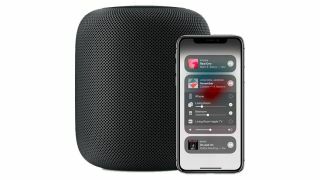 While Siri is integrated into HomePod, other speakers (such as the Sonos One) rely on AirPlay 2's connection to your iOS device to speak to Siri. One key thing about AirPlay 2 is that the music source (and control) is always an Apple product. You can't get AirPlay 2 on an Android device. Which Apple products have AirPlay 2? The following Apple products running iOS 11.4 or later support AirPlay 2. What other AirPlay 2-compatible products are there? On the audio side, there is already a long list of well-established brands signed up to use AirPlay 2. Naim, Bose, Bang & Olufsen, Devialet, Dynaudio, Bowers & Wilkins, Bluesound, Libratone, Denon and the Apple-owned Beats were all name-dropped at WWDC 2017, while Sonos made big waves when it said it would support AirPlay 2 in its newer products. Devialet's Phantom speakers are also on the list, Bose's new smart speaker and soundbars will be getting it in 2019, and we suspect these aren't the only products that will get an AirPlay 2 update in the next 12 months. Will all AirPlay speakers be updated to AirPlay 2? Sadly, no. With specific hardware and software needed to support AirPlay 2, it's looking more likely older AirPlay products won't be able to automatically upgrade to AirPlay 2. Sonos, for example, is restricting its AirPlay 2 capability to its newer products (Play:5 2nd gen onwards) and promises it will be available in future Sonos products. Similarly, Libratone's current Zipp speakers received the streaming update, but it won't come to its AirPlay-connected Diva soundbar or other older products. B&W has confirmed that none of its existing wireless AirPlay speakers - Zeppelin Wireless, A5, A7 - will be updated to AirPlay 2. Instead, the company is focusing on brand new products that will have AirPlay 2 on its list of features. A new Zeppelin Air, perhaps? Meanwhile, all of Bluesound's new Generation 2i products now support AirPlay 2 thanks to a software update via the BluOS app. If you have older Bluesound products, you will need at least one 2i product in the mix to get access to AirPlay 2 and its features. If you already have an AirPlay-compatible product, check with the product's website to see if it's due an AirPlay 2 update. If it's a newer product, you might be in luck - but it looks like it's a case-by-case basis at the moment. We'll keep this page updated with more supported products as they're announced. For all AirPlay 2 products, including smart lights and other smart home accessories compatible with HomeKit, check out the full list on Apple's site. Which TVs support AirPlay 2? The big news from CES 2019 was the announcement that AirPlay 2 will arrive on a number of TVs in 2019. Select models from LG, Samsung, Sony and Vizio will all be compatible with AirPlay 2 and it's not just premium sets that will get the feature. This means you'll be able to use AirPlay 2 to send your favourite photos, music and video clips to your new set. A number of Samsung's 2019 TVs will go even further and actually have iTunes built-in - you'll be able to stream directly to your TV from the iTunes store, as if you had an Apple TV 4K connected. What are the alternatives to AirPlay 2? The most obvious alternative to AirPlay 2 is Google's Chromecast technology, which is widely supported by a huge range of products. Using a Chromecast Audio stick or a Chromecast video device, you can stream content to your hi-fi system or TV over your home's wi-fi network. Some products also have Chromecast built-in, so you don't need an external Chromecast device. There are two key differences between AirPlay 2 and Chromecast: Chromecast works across iOS and Android devices, and your phone or tablet acts as a remote while the speaker plays the file from the internet, rather than the audio being sent from your smartphone. There are also third-party applications that will let you Chromecast local audio from your phone to the speaker. How and when can you get AirPlay 2? AirPlay 2 is available on compatible Apple devices running iOS 11.4 or later right now. You simply need to download and install the latest iOS software on your Apple smartphone or tablet. HomePods should update automatically, as long as auto updates are enabled in the Home app. You'll need a second HomePod to get the benefits of the stereo pairing (and multi-room) features, naturally. For third-party brands, you'll have to initiate a software update. Simply go into the product's app or check the company website to see how you carry out the update. We're certain more manufacturers will bring out new products with AirPlay 2 functionality, or update existing ones. So stay tuned as we'll keep updating this page as we receive more information.